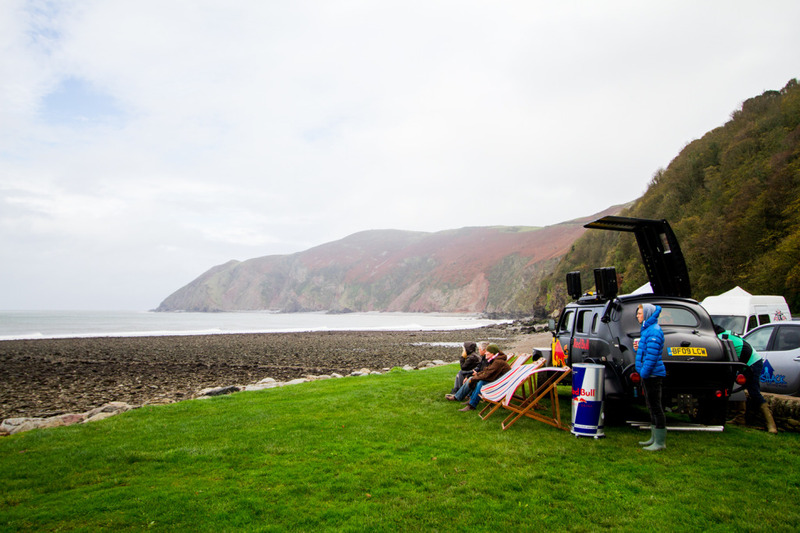 After weeks of waiting, yesterday saw The UKPSA Wave Breaker Series at Lynmouth in North Devon given the go ahead. A solid swell and favourable winds greeted competitors as they descended on the sleepy Devon town for a day of excellent waves reeling off down one of England’s best point breaks. Although conditions appeared a little small and wonky first thing, after a few hours, which the competitors spent free surfing and eating fry ups, the tide moved into the sweet spot and the comp was called on. The wave demands almost an entirely different approach to any other wave on tour, with a necessity for flow, good linking of turns and maintenance of down the line speed taking precedence over attributes more favoured by the beach break events. 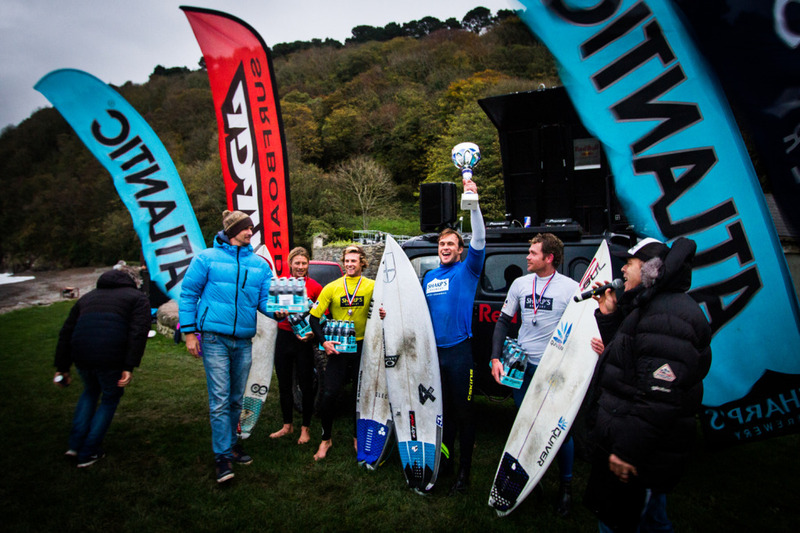 As a result what ensued was a fairly unique day of British surfing competitions, with an abundance of waves allowing the 24 competitors to really demonstrate their surfing ability. Despite getting clearance to run the event from the council, the UKPSA did not have the powers to enforce the clearance of the line up, meaning competitors paddled out along side an assembled pack and were forced to share waves, sometimes in the most literal sense, with them. For the most part the free surfers were respectful of the competitors however there were some instances, generally where a competitor was dropped in on, which prompted notoriously outspoken tour commentator Nick Williams to bellow over the loud speaker that there were some in the line up who ought to be ashamed of themselves. Whilst its understandable that the countries best surfers all turing up to your regular spot on the same day is not ideal, it’s perhaps worth considering, next time you find yourself in a discussion about Britain’s lack of competitive success on an international level, whether the fact that our competitors are not even afforded an entire line up to compete in may play its part. The overall standard of surfing was extremely high, however certain competitors stood out from the get go. Miles Lee Hagreaves, for example put on a solid vertical backhand clinic throughout the competition only to loose out in a closely fought semi to eventual finalists Oli Adams and Egor Harriss. Harry Timson, who ended up as the only goofy foot in the final, also put on a impressive show shooting off down the line at lightning speed each time he got to his feet and attacking each section with a diverse and critical repertoire of manoeuvres. Alan Stokes, Egor Harriss and Jayce Robinson also put on a consistent series of solid back hand performances, seamlessly linking textbook vert re-entries, big arcing carves and solid lip line floaters. Eventual event winner Oli Adams surfed smart and explosively throughout the event, pacing himself perfectly to peak in the final, where he delivered an undeniable dominant performance. In true UKPSA style, Oli, who is still in recovery from a life changing operation less than a year ago, has been heaped with praise by his fellow competitors, with Stokesy hailing his victory ‘inspiring and motivational’ in an instagram post. We’d like to echo these sentiments as well as mentioning the fact that Oli may well have just become the first professional surfer to win an event with a colostomy bag, which is an undeniably impressive feat.